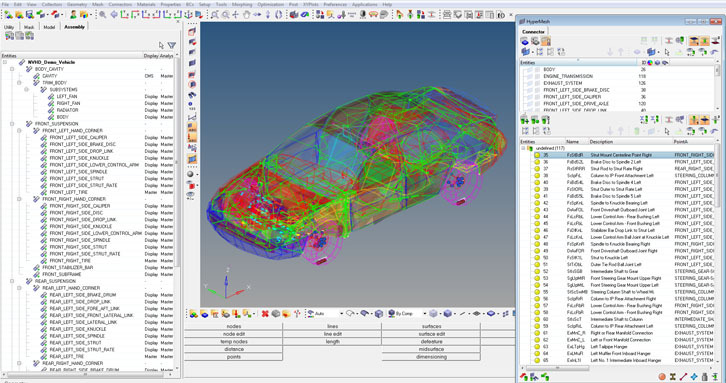 With the NVH Director HyperWorks provides a customized environment for automotive NVH modeling and analysis needs. 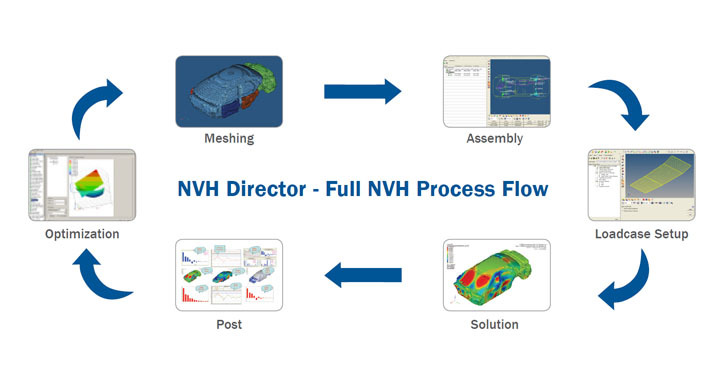 A number of integrated components help NVH users to execute a true full vehicle analysis process efficiently. "This ML-Studio process automation solution with HyperWorks improves the quality of our NVH process and the productivity of our team a lot." HyperMesh provides powerful geometry interfaces and a meshing engine that creates high quality component models quickly and easily, whether done interactively or in a batch process. Managing include files and connectors, model browsing, and control of model display are key functionalities required to manage these large, complex models. 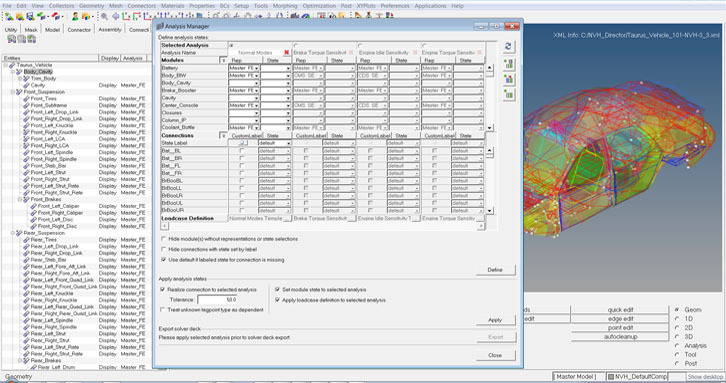 The powerful, flexible and customizable post-processing tools of HyperWorks cover all the needs of a noise and vibration analyst, from animating deformations to ranking participation results. 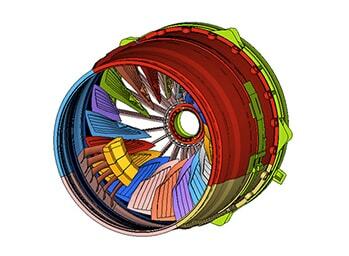 All standard outputs used in noise and vibration analysis are supported. 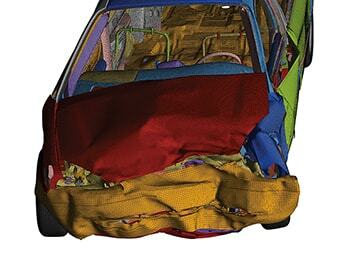 In addition, NVH Director provides powerful post-processing utilities for understanding the physical root causes of NVH problems, and identifying sensitive parameters through quick what-if studies. 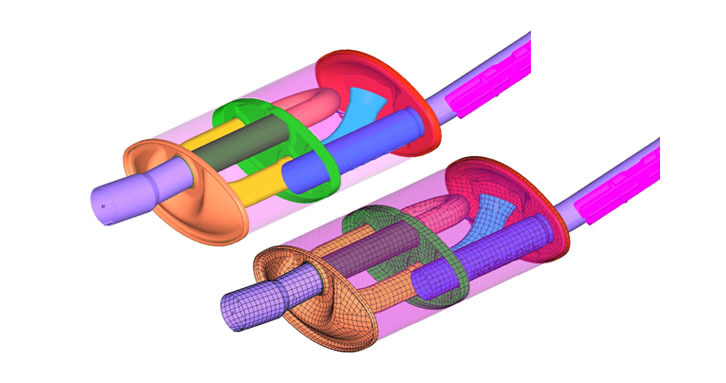 These tools enable engineers to obtain a full understanding of physical root causes by leveraging mathematical cause-effect relationships and identify sensitive parameters through quick what-if studies. 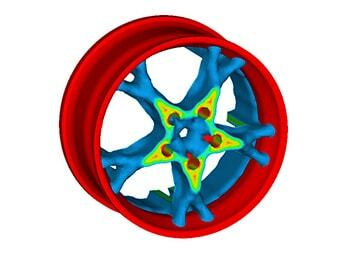 As a result, NVH Director significantly reduces physical testing by running many iterations in CAE simulation, and improves the value of testing by helping the engineer learn more from simulation. OptiStruct is a modern general purpose FE solver, and a worldwide leader in advanced NVH analysis, capable of solving the largest problems at the highest speed possible. 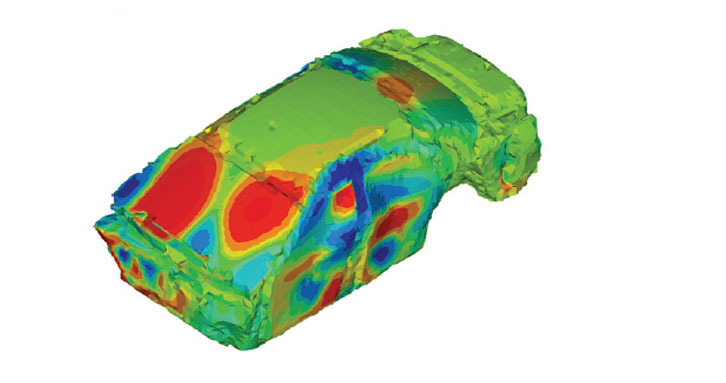 It provides advanced features, such as coupled structure-fluid analysis, superelement reduction, advanced diagnostic output, and optimization capabilities that are needed to tackle the most complicated NVH problems in many industries – automotive, aerospace, rail, industrial equipment, ship building, and electronics to name a few. 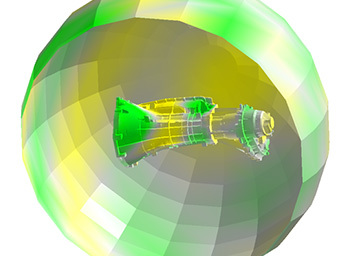 AVL EXCITE™ Acoustics is a tool for the calculation of sound radiation in free field from vibrating structures such as engines and power units using the Wave Based Technique (WBT). Coustyx from ANSOL is an analysis software that integrates Advanced Boundary Element formulations with Fast Multipole Method to yield fast, accurate solutions to very large problems in Acoustics, across a wide frequency range. 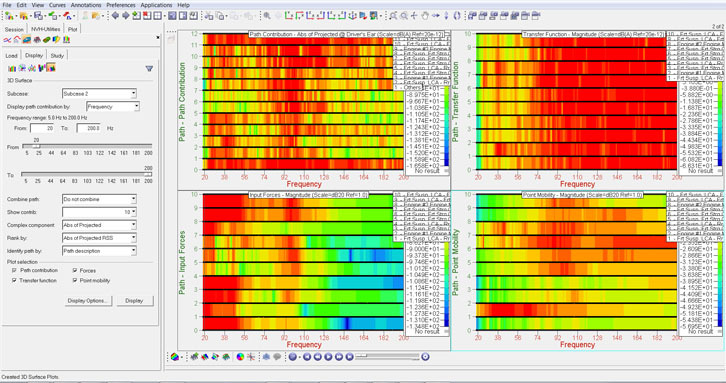 Insight+ from Brüel & Kjær allows NVH analysis and playback to calculate, listen to and modify individual noise and vibration contributions from your test data and/or CAE models in the full frequency range, bringing a realistic experience of NVH characteristics forward in the design process. SEAM® from Cambridge Collaborative is a software for studying the dynamic response of complex structures at mid and high frequencies. SEAM is used to predict interior noise and vibration in automobiles, aircraft, and construction equipment cabs as well as the radiated noise from ships and the vibroacoustic environments for spacecraft. 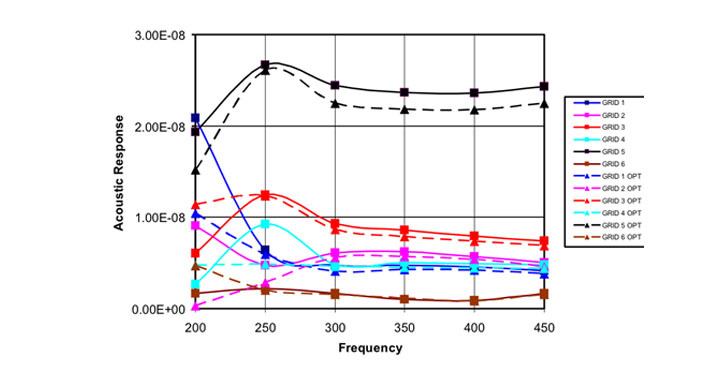 AlphaCell from Matelys is a complete and accurate TMM/FTMM solution that allows simulation of the vibro-acoustic response of multi-layer trims under various sound excitations (airborne, structure borne, turbulent boundary layer). EFEA from MES can perform mid to high frequency vibration and acoustic simulations for complex structural – acoustic systems. VMAP from TechPassion bridges this gap between virtual prototyping and experimentation in the product design cycle. 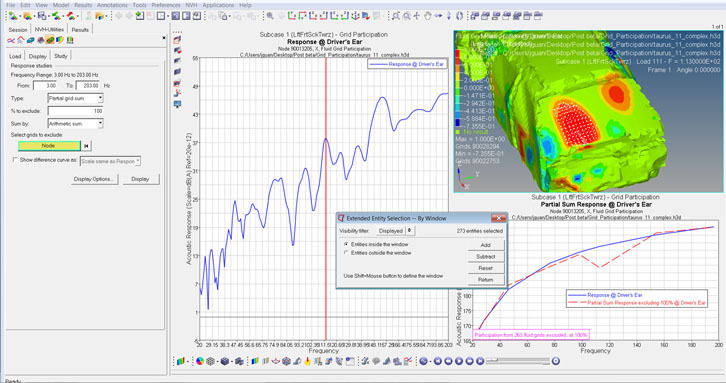 VMAP is used in various design stages as a design, diagnosis and manufacturing quality assurance tool. 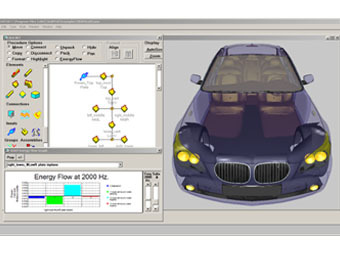 NVH Director provides an integrated simulation environment for true full vehicle NVH simulation. 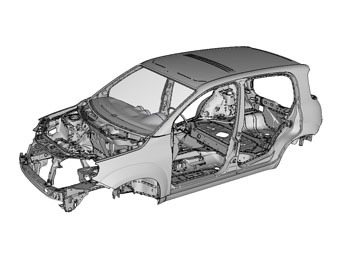 It includes a number of integrated components to help NVH users execute a typical full vehicle analysis process efficiently, and enhance their ability to drive product design and performance.